Eats n Feats: The Best Carrot Cake - Evah!!! Just look at that beauty! Oh man, it is sweet, nutty, moist, spicy and just downright pretty!! This recipe is from my new favorite food blog: Pioneer Woman (click on the name to go there). I discerned from her writings that she lives on a horse/cattle ranch somewhere in Oklahoma and her blog is full of good recipes and she is really funny. 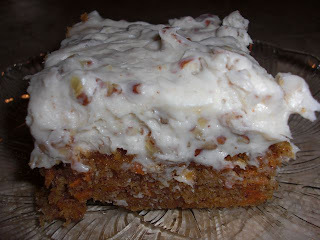 Click here for the recipe to the carrot cake. I actually cut the recipe in half and put it in an 8x8 pan at 350 for about 30 minutes. I did that because, well, there are just two of us and a full cake just seems a bit over the top. Of course that was before we tasted it! Run to the store and get the stuff to make this cake . . . Now! What are you waiting for? Wow...awesome picture of the cake. I think carrot cake is an acceptable dessert because you probably get 1/4 of a serving of vegetables, right? Did you have cake on your birthday? Brownies and cakes so far....I think it is time to blog about the Superb Fudge Pie. My mouth is watering...that looks fabulous!! I went to PW website...it is so much fun to read. She has a good style of writing, that reminds me of the way I think. I love it for the carrots!